We seem to have an over abundance of eggs lately. Our ladies must be enjoying the spring weather we've been having. Last night I was searching for some new egg ideas and came across this recipe for challah at Smitten Kitchen. I've never made challah before, or even a loaf of any other kind of bread. I have, however, been very keen on challah lately. It makes for the best french toast ever and a killer grilled cheese as well. It's a good time to try making some challah. I am far from having any expertise in challah, but Smitten's recipe was easy to follow and fairly easy to execute. The rising process is not a very long one, which is nice. I did, however, choose to do the third rising in the refrigerator for a few hours, as suggested, in order to achieve a "more deeply-developed flavor". Using my KitchenAid standing mixer with the hook attachment was not a problem and made for much easier work. I also added raisins to both loaves. 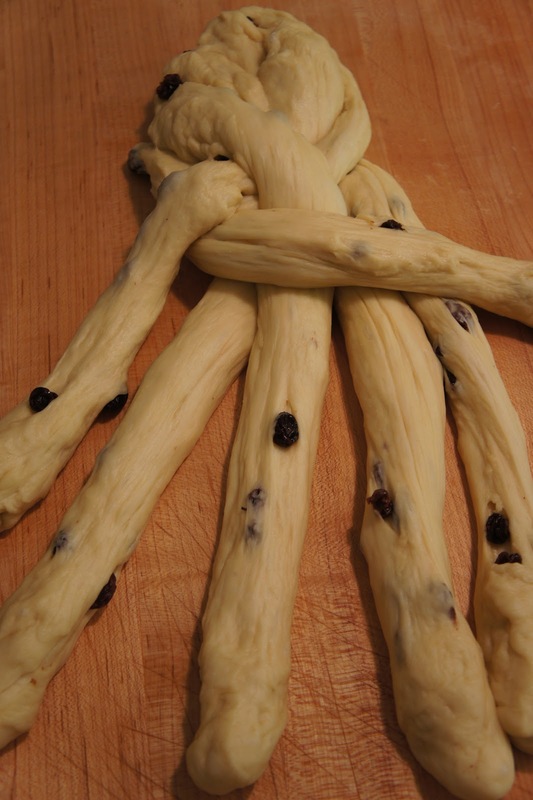 The braiding was not as complicated as I first thought it would be and working with risen dough is just, well, fun. As promised, the aroma of the challah baking filled the house with a heavenly scent so good, it was worth the making of the challah alone. I've not had challah with raisins before, but it really adds a nice dimension to it. The outside crust was crispy and the inside was soft and light. Wonderful. In retrospect, I should have frozen one of the doughs, what was I thinking? Will we get through two challah's before they go bad? Well, not to worry, we can always make french toast! Thanks for the eggs ladies!